Since about twenty years, the Dutch design magazine Items annually visits all graduation shows of design schools in the Netherlands and Belgian Flanders. A huge operation for a small magazine involving dozens of schools, a host of reviewers and tight logistics — graduation shows typically last only a few days, all within the time frame of a few weeks. A total of hundreds of suggestions by our scouts is then assembled by Items‘ editorial staff and reviewed for final selection by a jury of Items‘ editors reinforced by specialists from various design disciplines. In three meetings, focusing on product and interior design, graphic and digital design, and fashion, textile and jewelry design respectively, the final selection of between 50 and 70 graduation projects is made. Published in the magazine’s fall issue, this selection represents the debut of the best and brightest young Dutch design talents of the year. 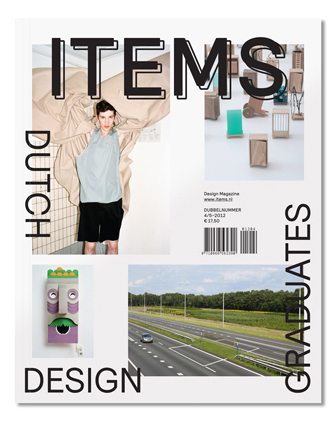 Over the past decades, Items has been able to organize occasional collaboratory exhibitions with the annual graduation selection, but 2012 saw the first dedicated exhibition of what we now term ITEMS Dutch Design Graduates. In the impressive Machine Hall at the center of Dutch Design Week in Eindhoven — the Netherlands’ main annual design event — a selection of 36 Dutch Design Graduates was shown to an audience of 15.000 visitors in 8 days. Items, in collaboration with its partners, is committed to making the annual graduation show a central feature of design’s public agenda in the Netherlands — a high-profile podium for young and upcoming Dutch design talent. Over the years, we intend to develop this website as an archive of our yearly selection. With this, a database documenting the start of many Dutch design careers will be established. A future reference for Dutch design’s continuing vibrancy. Consider it a sign of a growing reflexivity of design. Design as an inquisitive eye on reality. 2012’s crop of young Dutch designers consists of 68 graduation projects, of which 36 were shown at the Dutch Design Graduates exhibition in Eindhoven. 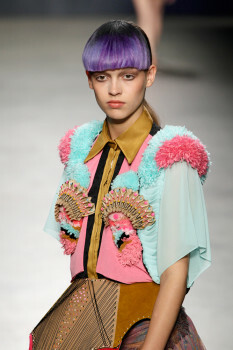 On this site, and on the iPad app that accompanies it, you can browse trough the complete selection. 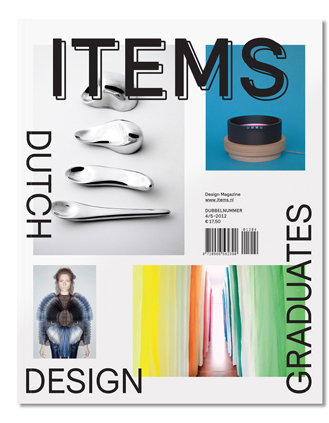 For over 30 years, Items has been the leading design magazine in the Netherlands. With an archive of 175 issues since 1982, Items represents three decades of development in design as cultural activity, both nationally and internationally. Covering all design disciplines, from product-, interior- and graphic design to digital design and fashion, Items has been a critical and reflective medium for both professionals and aficionados. In 2013, Items will be reassessing its position as both a magazine and a platform for debate and reflection on design. Items will change – but it won’t go away. Please check Items’ website, Facebook page, twitter feed, and newsletter to stay informed about where we’re going. We’d love you to join our adventure! 20 – 28 October, 2012. ITEMS Design Magazine 4/5 is still for sale online! (2 different ones, actually) and is offset printed in full colour entirely. Note: printed version is available in Dutch only.